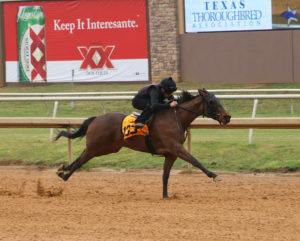 Four fillies clocked an eighth-mile in :10 2/5 on Sunday at Lone Star Park during the under tack show for the Texas 2-Year-Olds in Training Sale. The auction, originally scheduled for Tuesday, will be held this Wednesday at noon. The sale is sponsored by the Texas Thoroughbred Association and Lone Star Park. “We saw some great times considering the track was a bit heavy from some significant rain last night, and early on during the under tack there was a pretty stiff head wind,” said Tim Boyce, sales manager. The first horse to clock the co-fastest time of the day was hip 35, a Kentucky-bred from the first crop of Florida Derby (G1) and Donn Handicap (G1) winner Constitution. Consigned by Diamond C Racing Stables, she is out of the winning Henny Hughes mare Lil Red Cozette, whose only starter is a stakes winner by Graydar. Hip 58, a Kentucky-bred daughter of Jockey Club Gold Cup (G1) winner Flat Out from the consignment of Bryan Ford, agent, equaled the fastest clocking. The March 4 foal is the second out of the Dehere mare Preciouspurplerain. From the consignment of Twin Oaks Training Center, agent, hip 72 also joined the fastest group. The Louisiana-bred is from the second crop of Grade 2 winner Guilt Trip out of the Known Fact mare Seda Fina, whose offspring include multiple stakes winner Su Casa G Casa. The final horse to work :10 2/5 was hip 133, a Texas-bred daughter of Grade 1 winner Twirling Candy, also consigned by Twin Oaks Training Center, agent. She is the first foal out of the winning War Front mare Clara Kelly. Prior to Wednesday’s sale, a pre-sale brunch will be held from 9 a.m. to 11 a.m. in the sales pavilion with a complementary bloody marys and mimosas along with a selection of complimentary breakfast items and food for purchase. Replays of the under tack show will posted later tonight. Click here to view the complete list of times.